As long as there's this presumption if the laptop has a body that is thin and light weight, it feels fragile or not tough. But the presumption does not apply to the latest Asus laptops Asus launched in Indonesia market, namely the ASUS ZenBook 13 UX331UAL. This new Asus laptop is another variant of the version UX331UN. Laptop Asus ZenBook 13 UX331UAL have the same thickness as his brother, ZenBook UX331UN IE just 13.9 millimeters. As for does it weigh only 985 grams only. Latest Asus laptop ZenBook 13 UX331UAL uses a magnesium alloy body with a very light. As for sandblasting finish used concentric circle pattern replaces the commonly used on ZenBook. Compared to ZenBook the previous 13 using the aluminum chassis, the construction of a magnesium-based alloy on ZenBook 13 UX331UAL makes it very tough. He even meets the standard military-grade MIL-STD 810G and passes the test of durability to ensure its ability to operate in a variety of conditions. Although it has a thin and light body, the latest Asus Laptop ZenBook 13 UX331UAL had escaped heavy testing the durability of standard military-grade MIL-STD 810G to ensure the device can be operated in different environmental conditions. Not only that, it also has passed the internal testing of the actual ASUS also goes beyond industry standards. With a screen measuring 13.3 inches and a resolution of Full HD, ASUS ZenBook UX331UAL have a dimension that does not vary much with the A4 sized paper. Thus, this laptop can be easily inserted into your suitcase, backpack, tote bags even women. The size is much smaller than ultrabook berikuran 13 inches in General. The secret is on the bezel of the screen features NanoEdge. Laptop Asus ZenBook 13 UX331UAL reinforced by the fastest Intel Core i processor generation 8. For the sake of shoring up high-performance processor, the ASUS harmonising with the fastest 2133MHz DDR4 RAM as well as a high speed and reliable storage, based on m. 2 SSD. Of the benchmark test results, seen that this laptop is capable to be used as a supporting device productivity. Good essential productivity applications such as office, email or other productivity applications, to digital content editing either photos or video. Graphics performance is not too high because it's not addressed to it. Playing 3D games, as long as it is still in the low to medium resolution, it can still be done. 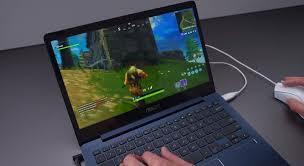 Run the application did not problem because the rendering performance of the Intel Core processor 8th generation, both while working in single core or multi-core has been very good. When used on a non-stop multitasking application, measurement of battery life PCMark indicates that the battery on the ZenBook 13 UX331UAL able to supply power for up to 4 hours 43 minutes. Of course, if Your not too intensive use such as the aforementioned benchmark testing, the battery is certainly able to survive much longer. In certain scenarios, the ASUS laptop battery even claimed it was able to last up to 15 hours. One thing that is very important but seldom noted, is the Wi-Fi capabilities. On a laptop, this capability is the important thing. 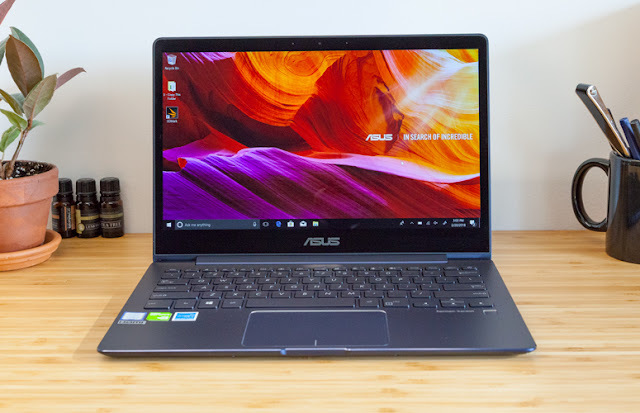 On ZenBook 13 UX331UAL, ASUS Wi-Fi features the Master that made this laptop was able to get a higher transfer speed and longer distances compared to other laptops in General. With free Wi-Fi, users can enjoy Masters video streaming YouTube FullHD more smoothly at a distance of 300 metres or more, or at least at a distance of 225 metres, despite interference from USB 3.0 devices. The distance is approximately 65 metres further than with other laptops in General that do not have Wi-Fi. Along with the dual-band 802.11 technology air conditioning, free Wi-Fi offers speeds up to Master 867Mbps or about 6 x faster than single-stream 802 .11n. This allows the user to work with more freely in the Office or at your favorite coffee shop. 0 Response to "Latest ASUS laptop ZenBook UX331UAL Design, thin and lightweight but Strong Body"